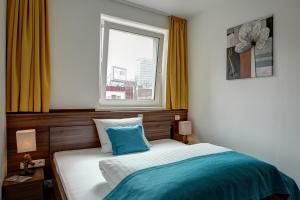 This stylish hotel is located directly on the Reeperbahn in the heart of Hamburg’s St Pauli district. It offers free WiFi access. Centro Hotel North provides bright rooms decorated with contemporary furniture and decorative wall art. Each is complete with a modern bathroom featuring a hairdryer and free toiletries. Guests will find numerous shops, bars, cafés and restaurants within a 5-minute walk of Centro Hotel North. The St. Pauli Piers (Landungsbrücken) is 750 metres from Centro Hotel North. Other nearby attractions include Planten un Blomen park and the Elbe Philharmonic Hall. Hamburg Central Station is 4 km from the hotel and Hamburg International Airport is 12 km away. Stylish room with contemporary furniture features a flat-screen TV, work desk and modern bathroom.